Russian Defense Ministry officers at the National Defense Management Center in Moscow. Success in 21st century warfare is ensured not only by new weapons, but also modern command and control technology. 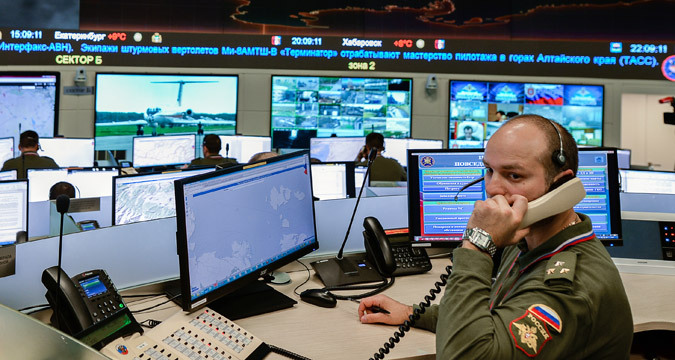 Having marked its first year of operation, the giant new military control center in Moscow provides real-time command of tasks, including the current military campaign in the Middle East. The military campaign in Syria is taking place thousands of kilometers away from the territory of Russia, yet the real-time command of these unprecedented hi-tech operations unfolds in the heart of Moscow. The coordination of the participating forces, planning of operations and allocation of resources needed for a decisive victory is performed by the new National Defense Control Center (NDCC), which was launched on Dec. 1, 2014. There is nothing classified about the actual location of the giant military nerve center. As might be expected, it lies in the heart of the Russian capital, in the middle of blocks of streets traditionally occupied only by Soviet-era buildings belonging to the military. But this is largely where publicly available information about the site and its myriad systems ends. The NDCC was created through a major upgrade of the operations and Soviet-built premises of the Central Command of the General Staff, a unit tasked with round-the-clock monitoring of military threats against Russia, particularly ballistic missile launches, and deployment of strategic nuclear weapons. The restructuring yielded a completely new complex of buildings towering on the bank of the Moskva River. But what is visible from the street gives little idea of the center's true size, since most of the premises are located underground, protected beneath a thick layer of concrete. The site, whose innermost areas are designed to withstand a hit by a nuclear warhead, also has helipads and some 930 miles of tunnels, corridors and other communications lines needed to ensure the NDCC's smooth assumption of control of the entire country in case of war. "The creation of NDCC was one of the biggest military projects of the past few years," Lt. General Mikhail Mizintsev, the NDCC chief, told Lenta.ru at the time of its opening. "The closest analogy in the past in terms of functions and tasks was the Commander-in-Chief HQ in 1941-45, which centralized all controls of both the military machine and the economy of the nation in the interests of the war." But as well as military and possible national governance functions, the NDCC oversees a host of other essential functions. These include the monitoring of hardware produced by defense contractors, the operation of oil refineries, and also the tracking of weather conditions and their effect on transportation routes. The complex comprises a number of data centers that are differentiated according to territories, and have a total computer capacity that it is claimed exceeds that of the U.S. Pentagon several times over. While operating as a single integrated system, the constituent centers double up on each other in case any of them fails. The center's computers operate using only Russian technologies. As well as efficiently processing incoming information, they can also simulate possible crisis situations that might require the involvement of the Russian armed forces. Working in real time, the NDCC specialists also control combat training, the state's nuclear deterrent, and the daily life of the army. Several hundred officers work in the center every day, supported by a special complex that caters to all needs while on duty. The heart of the center is a large control and coordination hall, where the meetings of the senior military leadership take place. Here the activities of the Russian armed forces are monitored on large screens around the clock. So too is the progress of the Syrian campaign, with the main areas of operation of the Russian aircraft and the ground forces of the Syrian army displayed on digital maps. Thanks to the center's modern communications systems, decisions on the adjustments of the current operation are taken here and quickly transferred to the field. The set-up allows the staff to see all processes taking place in the armed forces, thereby minimizing the time required to resolve tasks and challenges that arise. The Defense Ministry has not disclosed the price tag for the entire site, but it is estimated at the equivalent of several billion dollars.